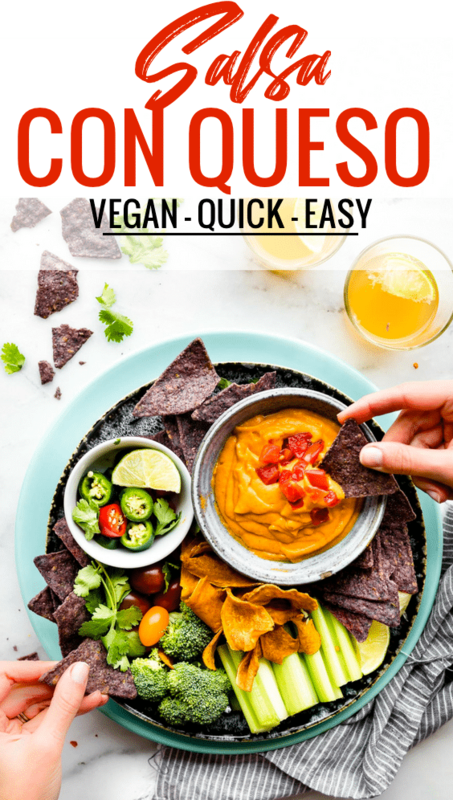 This Vegan Salsa Con Queso recipe is sponsored by my friends at Red Gold’s Tomato! I’m thankful they supply us with such a high quality product and the chance to share a healthy family recipe. Oh my goodness, oh my goodness! Ya’ll, I made savory vegan cheese that’s creamy, easy to make in 10 minutes, and made with REAL food. Heck it’s even Whole 30-friendly. What the what?!! I know, I’m still in shock too. In fact, I’ve made three batches already and put this salsa con queso “cheese” on just about EVERYTHING! Also, you’ll never believe this, but…. this cheesy salsa dip platter could totally count as a meal. I tend do that often, don’t I? GASP! Let’s have a family gathering and eat all the cheese and chips! Haha, my chips and salsa loving mother would be so proud. Alright alright, I know you’re probably so curious and confused about this whole vegan cheese shindig. I’ll explain. Get ready for your MIND TO BE BLOWN! So what’s in it? Glad you asked. 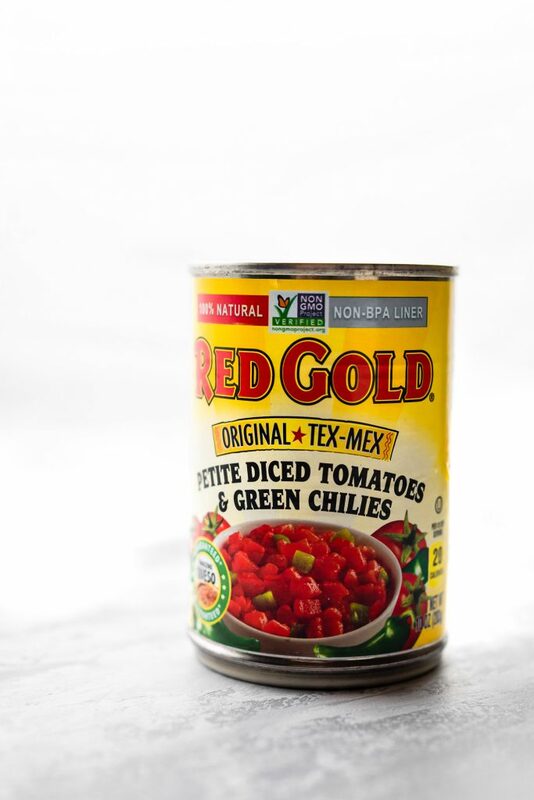 Red Gold’s Tex-Mex Green Chile and Vine Ripe Diced Tomatoes! That’s it my friends. You just steam the veggies then blend it all together. It’s smooth, creamy, and HOT right out of the blender. The KEY ROCK STAR ingredient making this vegan cheese even more flavorful is Red Gold’s Tex Mex Green Chile Petite Tomatoes, obviously. It’s what takes this vegan salsa con queso up to the NEXT LEVEL. But don’t worry, these tomatoes have a mild spice flavor, so it’s great for younger kids who don’t necessarily like spicy yet. That being said, if you want to make this queso more spicy, I highly recommend adding a wee bit of Red Gold’s Sriracha ketchup. That extra kick of heat is perrrrrfect! Red Gold’s Tomatoes, oh how I love this family oriented company and what they are about! You’ve seen me gush about Red Gold’s tomatoes in my Cuban Picadillo recipe and my Snappy Sweet Potato Spaghetti recipes. But let’s refresh, mmm k? RED GOLD’S TOMATOES, when I think of this brand, two things come to mind: Family grown and quality ya’ll! Red Gold’s has been working with local family farms for over 70 years to grow the best tasting tomatoes in the world. Sustainably grown on Midwest family farms. Heck, you can even meet their family farms here. They care about their farming and land. Sustainable Farming that helps produce the best tomatoes. Non-GMO project verified and packed in non BPA lined cans. 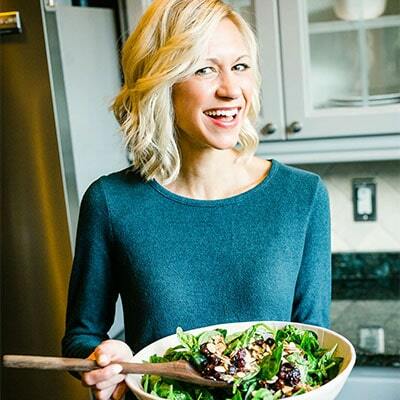 I wanted to a create a recipe that was not only healthy, easy to make, and delicious, but one that brings a family or gathering of friends together. Um, hello! Salsa Con Queso is one of those recipes that will most definitely bring everyone together. Seeing that the super star ingredient in this recipe is Red Gold’s tomatoes, it seemed quite fitting. Don’t you think? In Texas, my family always gathers around chips, salsa, guacamole, and queso. It’s pre-dinner snacking at it’s finest! Lots of great conversation, laughs, and love! Just don’t ask my youngest niece to share the queso, that girl hogs it like no other. Haha! Alright, I hope I made you work up an appetite. 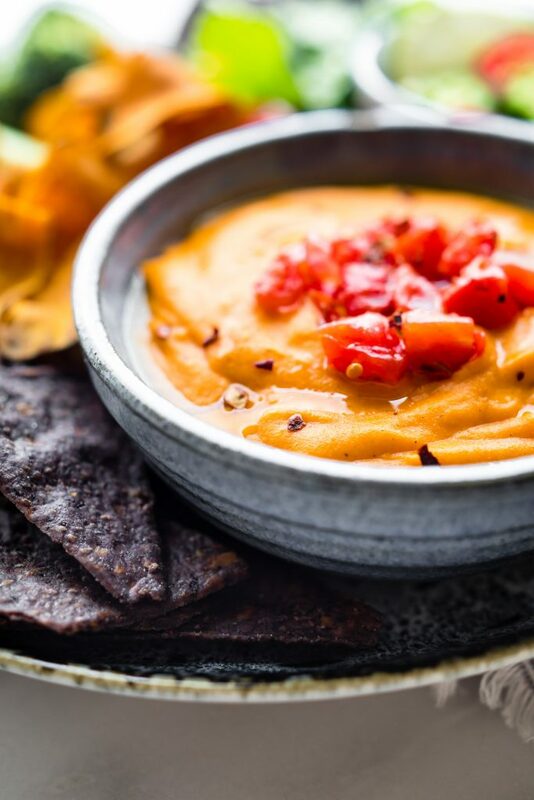 Get ready to devour this easy vegan cheese dip. Grab so of those versatile veggies, canned green chile tomatoes, and spices. 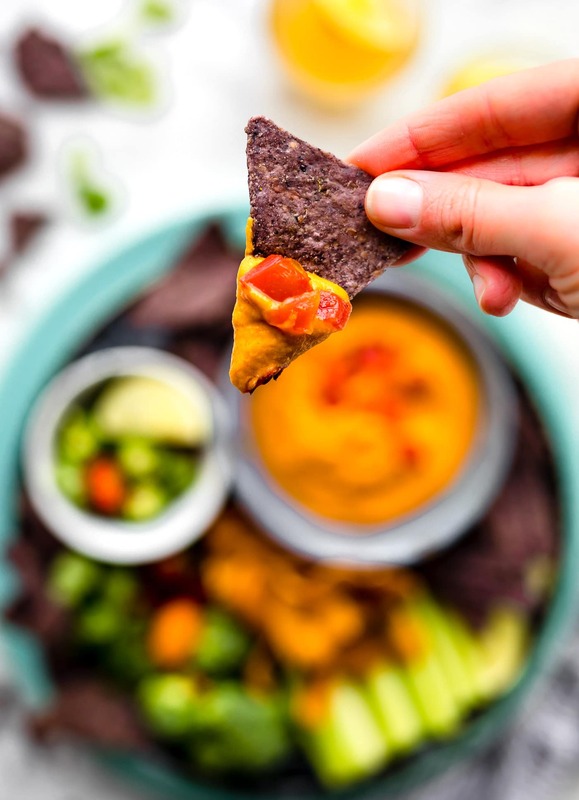 Your life is about be changed with VEGAN SALSA QUESO! 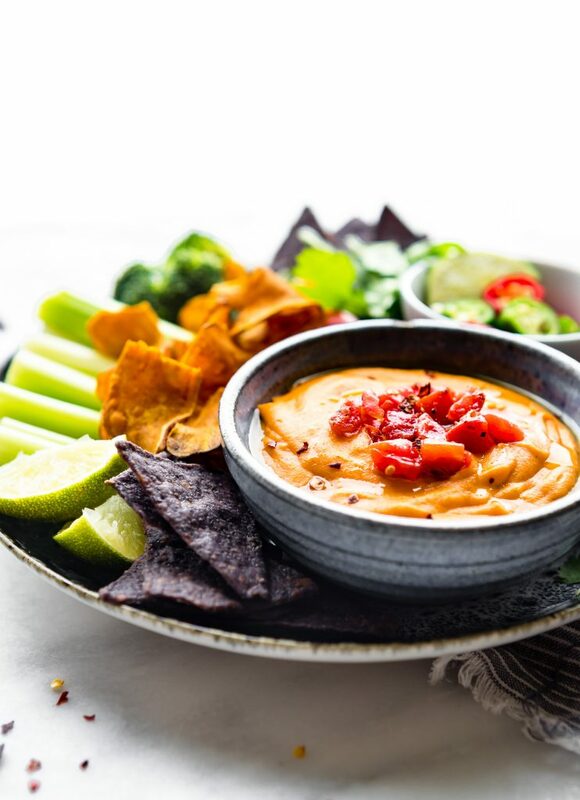 Vegan salsa con queso is a warm cheese dip recipe that’s quick & easy! 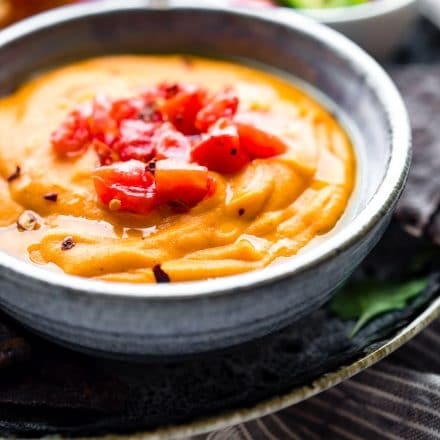 This vegan cheese dip is plant-based, using fresh vegetables & Tex-Mex spices. Gluten free, dairy free, low carb, grain free, and a Paleo option. 2/3 cup canned diced tomatoes with green chilies, drained (Red Gold Tomatoes). 1. First cook your vegetables. Peel your potato, pierce it with a fork, and place it in the microwave for 6 minutes until soft. Remove from microwave and cut into smaller pieces. Your potato should equal about 1 1/4 cup chopped. 2. Place your baby carrots and cauliflower rice in a large microwavable bowl, add a few tablespoons of broth or water, cover with a paper towel and place in the microwave for 1 to 2 minutes or until soft and cooked. Remove and drain excess water. If you don’t have a microwave, you can steam your vegetables on the stove top. Just make sure they are soft enough to blend and to discard the the water before blending. 3. 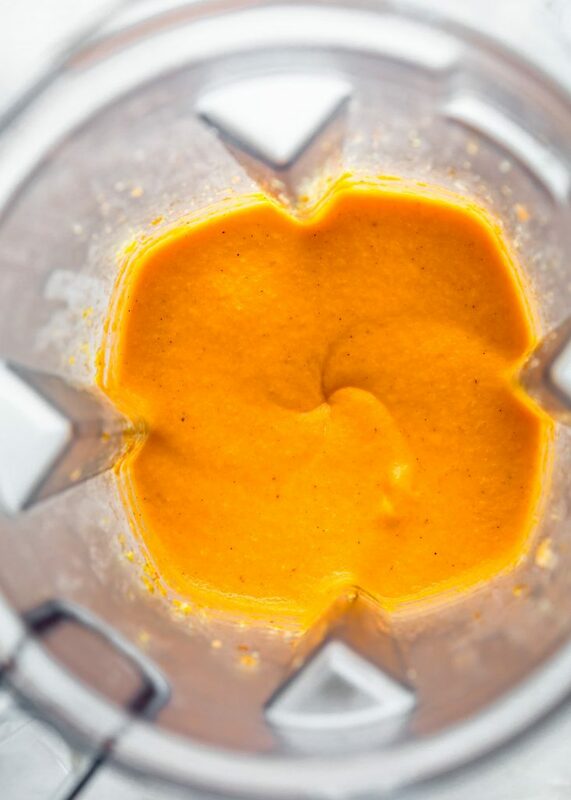 Next place your vegetables and oil in a blender or food processor. Blend until combined. 4. Add your lemon juice and canned tomatoes with green chilies. Blend again on high. 5. Lastly, add your nutritional yeast, remaining spices, and optional chili powder or spicy ketchup/tomato paste. 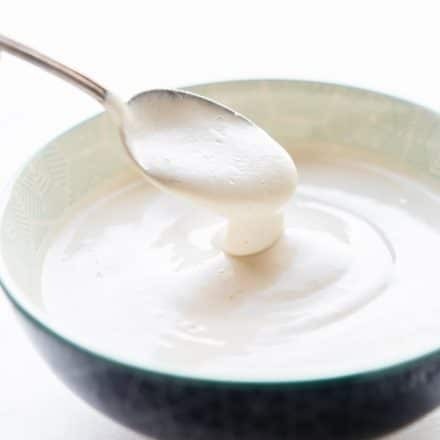 Blend on high until a creamy cheese texture is formed. It should look like queso or a melted cheddar. 6. You might have to scrape the sides a few times in order for the vegetables to blend well. 7. Pour the batter into a large bowl and serve with an arrangement of vegetables or gluten free tortilla chips. You can also keep half for other uses such as vegan mac and cheese pasta, nachos, etc. Keeps well sealed in the refrigerator for up to five days. 8. See notes for substitutes, if needed. 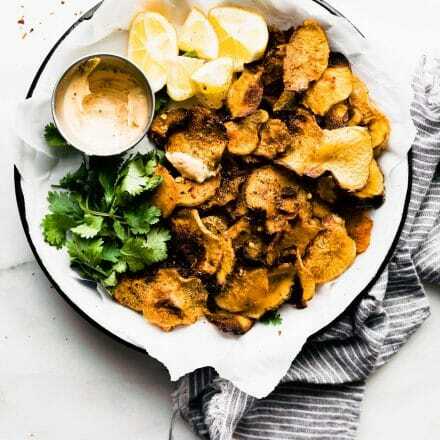 If you don’t want to use oil in this recipe, you may try using a creamy cashew butter or tahini. The texture and taste might be just a little different, but still tasty. Have you ever made a vegan cheese? What’s your favorite dish to make with Tex-Mex style tomatoes? Keep up with the Red Gold on social media. They are full of recipe and community inspiration! Facebook, Twitter, You Tube, and Pinterest. It’s like this recipe was made just for me – queso is my absolute favorite! Love that you’ve made it vegan with ingredients I already have on hand! Looks good enough to eat by the spoonful! Ok. This is beyond cool. I wonder if I could sneak it past Vegas? I’m betting yes! 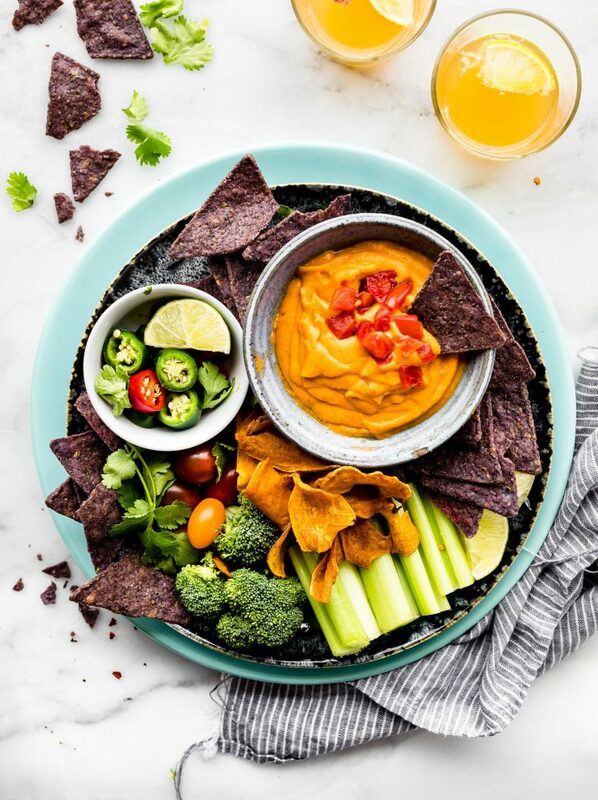 Loving this paleo version of a cheesy dip! The perfect appetizer, but I could totally make a meal out of it! Perfect for healthy holiday munching Lindsay! And as always, your photos blow me away! Thank you so much Mary Ann! Hope you have an awesome holiday. Wow, what a fun vegan queso! Sharing with my vegan and DF friends! Awesome! Thanks Sabrina!Let me know if they give it a whirl! 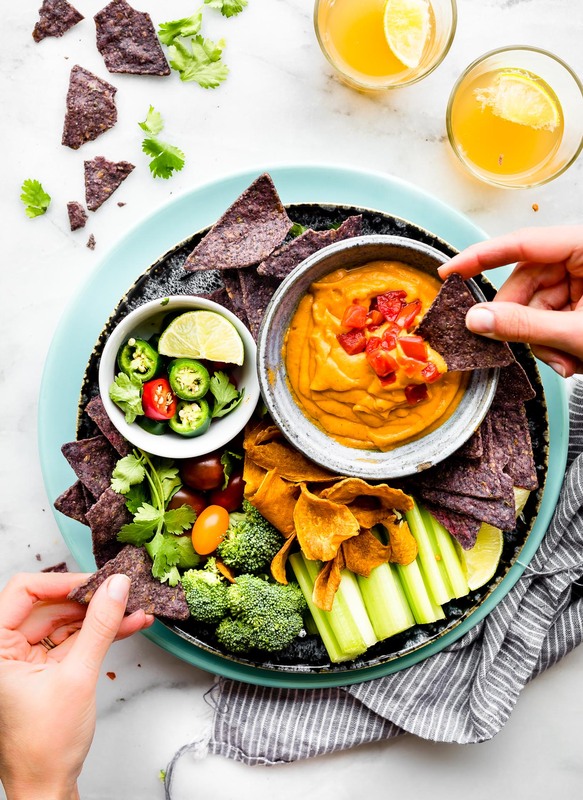 Really good dairy free dips like this are my weakness. MUST MAKE ASAP! 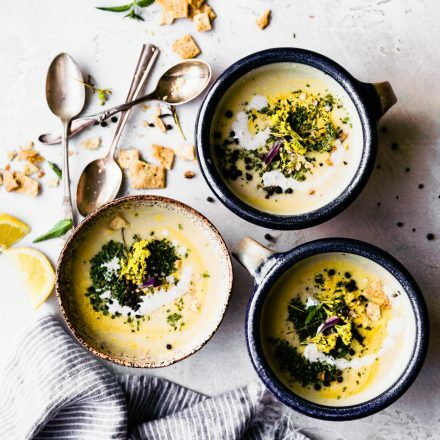 Love the vegan spin on this and yes, it would absolutely disappear in seconds here! I bet your boys wouldn’t even know this had veggies in it! I think vegans an non vegans would all love this! Oh wow!! 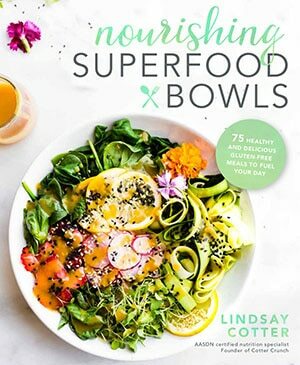 Love this recipe Lindsay! So wholesome and delicious! I would never think those ingredients would turn into a delicious queso. You’re such a wizard!!!! oh my gawd, making this!!! ok.. I am obsessed. Pia and I could take down this whole thing in the blink of an eye! I am ready to start dipping! This is one of your most brilliant recipes OF ALL TIME! Love that you used Red Gold Tomatoes! And potato? AMAZING. I’m so intrigued by this! It looks amazing. And yes, I could (and can!) just totally make a meal from appetizers. Seriously the best! Wonderful photos, friend! Thanks friend! Bring your cranberry Riesling sauce and let’s party! I just got sooooo hungry looking at this!!! You know my love of full fat dairy filled cheese, yes? And I still want this, and it wouldn’t count as a main meal. In fact, this would be my preference. LOVE that you made this vegan and gorgeous! Such a stunning crowd pleaser! Thanks liren! I know you’d love this! That looks awesome! Can’t believe it’s vegan! right? So easy too! and DELISH! So beautiful ! Thank you ! 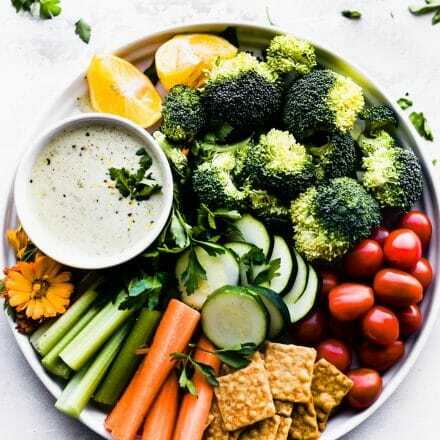 The food looks delicious and attractive, I like this dish.